The academic year 2012/2013 is slowly coming to its end and oikos Leipzig could look back at some fruitful and inspirational events. Besides the regular movie nights, reading circles and talks on sustainability issues, Leipzig organised two major events, the two-day de-growth conference in fall 2012 and three “action weeks” on share economy in May and June this year. The conference titled “Values, prosperity, well-being – (How) do we want to grow?” was held on November 29th and 30th and discussed questions such as “Is infinite growth in a physically finite world ever possible?”, “Does additional growth in the industrialized countries trigger increasing happiness?” and “What societal and environmental impacts result of our constant pursuit of growth?”. The two-day event was filled with lectures, panel discussions and workshops showing that commitment towards a sustainable development path exists on the political, corporate as well as societal level. The next major project concerned the topic of share economy, a global trend that has recently been catalysed by new digital technologies. Initiatives such as car-sharing, community gardens or couch-surfing are just a few of various examples for this movement. 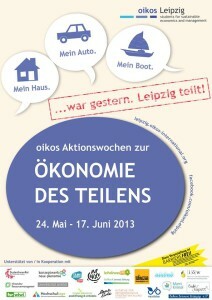 In order to sensitise as many people as possible for this topic and to present (local) initiatives that already incorporated the sharing aspect in their activities, oikos Leipzig planned three action weeks on share economy from May 24th to June 17th. Furthermore, we also wanted to explore whether share economy can only be seen as a temporary trend or whether it has the potential to lead to a more sustainable society in the long-run. Three weeks project was kicked by a “dinner hopping” called auf Haxe Leipzig that was organized in cooperation with Auf Haxe, a young Berlin start-up initiative establishing special, delicious and fun dinners in Germany. The main concept of auf Haxe is to build teams of two taking part in the dinner event with three courses (starter, main course, dessert), each of which is prepared and served in a different apartment of the team members. In the course of the evening, every team has eaten in three different houses and has met 12 different people. After dinner, the 45 participating teams (and many more sharing interested people) came together at our oikos party which was a great success and a good starting point for the interesting and inspiring following action weeks. In fact, everyone had so much fun, so that many more auf Haxe Leipzig are to come! The next event was a movie night where we showed the movie “One couch at a time” by Alexandra Liss, a movie about the couchsurfing movement and the connection to the concept of share economy. A readers’ circle with the broad topic share economy followed. Different articles were read and discussed that shed light on the concept of share economy in a positive but also critical way. Our fourth event was the workshop day, which we planned in cooperation with the trade school Halle (TAAK Halle). Based on the trade school movement, the aim was to create a platform were people could meet and exchange their knowledge. Our participants could choose among nine fun and interesting workshops, from “laughing yoga” to “lamps from sandwich paper DIY” and “creativity techniques”! 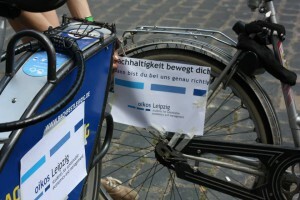 We continued with a somewhat “different” bike tour through Leipzig where we visited various local initiatives that already implement the concept of share economy in their everyday work and actions. These included a self-repair café, nextbike (bikesharing company) and a community garden, among others. The final action week was dominated by lectures. First, we were introduced to share economy from a scientific perspective by Maike Gossen from the Institute for Ecological Economy Research, Berlin. This more theoretical approach was followed by an evening with talks about share economy from a practical perspective. Representatives from Airbnb (an online platform where people can rent out their living spaces), from VisionBakery (the second-largest crowdfunding website in Germany) and from mamikreisel (an online platform where babyclothes can be bought, exchanged or sold), discussed the advantages and challenges of the share economy movement for their businesses. Similar to our kick-off event, we ended our action weeks with a lively and entertaining BBQ and swap party. Both the de-growth conference and the action weeks on share economy sparked some lively and in-depth discussions, resulted in interesting cooperation and new ties with other initiatives in Leipzig and Germany and helped to further integrate oikos Leipzig as an association to be reckoned with. The overall feed-back was very positive, most events were well attended and even resulted in motivated and enthusiastic oikos Leipzig members and supporters. We are therefore eagerly looking forward to the up-coming academic year, for which oikos Leipzig has already planned interesting new events through which to move the sustainability discussion forward!